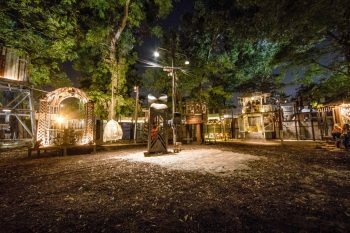 The Music Box Village: where play, imagination, collaboration, and community come together as artist-made, interactive “musical houses.” Begun in 2011, the Music Box has grown mightily through the idiosyncratic vision of hundreds of collaborators, in national and international locations. It has attracted tens of thousands of visitors, and featured Wilco, Solange Knowles, Gogol Bordello, Norah Jones, Preservation Hall, Lost Bayou Ramblers, Tank & the Bangas among others, to create new experimental performance together across the worlds of dance, storytelling, theater and more. We offer Education field trips and classes, and hands-on Public Hours. Airlift is the leading creator of out-in-the-streets public art in New Orleans. We instigate connections and opportunities with our large-scale spectacles since 2007, highlighting under-the-radar art and living folk culture. We work with our dynamic street culture, folk masters and a growing contemporary arts scene to create exhibitions, workshops, festivals, and performances in New Orleans and beyond.